The story is about a fish with shiny, multi-colored scales named the Rainbow Fish. He has blue, green, and purple scales; and among them, he has shiny silver scales he is always fond of, until one day, a small fish asks him if he could have one, but the Rainbow Fish refuses in a very rude manner. The other fish are very upset about his behavior and don't want to play with him anymore. Feeling upset, his only remaining friend, the starfish, tells him to go visit the wise octopus for advice. The Rainbow Fish finds the octopus and asks what he should do. When he goes to the cave, he sees the octopus. And when he meets the octopus, she says that she has been waiting for him. She explains that the waves have told her his story. Then, she tells Rainbow Fish that he must share the beauty of his scales with his friends (which means "to give one glittering scale to each of the other fish"). She tells him to share his scales with each of the other fish. And she continues to him that he may no longer be the most beautiful fish in the ocean, but he will discover how to be happy. When he encounters the small fish a second time, the Rainbow Fish gives him one of his precious scales and, seeing the joy of this little fish, immediately feels much better. Very soon the Rainbow Fish is surrounded by other fish requesting scales and he gives to each of them one of his shiny scales. Finally, in the end, despite having one shiny scale left (as he gave them all away to the other fish), he becomes very happy. A long way out in the deep blue sea there lived a fish. Not just an ordinary fish, but the most beautiful fish in the entire ocean. His scales were every shade of blue and green and purple, with sparkling silver scales among them. The other fish were amazed at his beauty. The called him Rainbow Fish. “Come on, Rainbow Fish,” they would call. “Come and play with us!” But the Rainbow Fish would just glide past, proud and silent, letting his scales shimmer. One day, a little blue fish followed after him. “Rainbow Fish,” he called, “wait for me! Please give me one of you shiny scales. They are so wonderful, and you have so many.” “You want me to give you one of special scales? Who do you think you are?” cried the Rainbow Fish. “Get away from me!” Shocked, the little blue fish swam away. He was so upset; he told all his friends what had happened. From then on, no one would have anything to do with the Rainbow Fish. They turned away when he swam by. What good were the dazzling, shimmering scales with no one to admire them? Now he was the loneliest fish in the entire ocean. One day he poured out his troubles to the starfish. “I really am beautiful. Why doesn’t anybody like me?” “I can’t answer that for you,” said the starfish. “But if you go beyond the coral reef to a deep cave you will find the wise octopus. Maybe she can help you.” The Rainbow Fish found the cave. It was very dark inside and he couldn’t see anything. Then suddenly two eyes caught him in their glare and the octopus emerged from the darkness. “I have been waiting for you,” said the octopus with a deep voice. “The waves have told me your story. This is my advice. Give a glittering scale to each of the other fish. You will no longer be the most beautiful fish in the sea, but you will discover how to be happy.” “I can’t…” the Rainbow Fish started to say, but the octopus had already disappeared into a dark cloud of ink. Give away my scales? My beautiful shining scales? Never. How could I ever be happy without them? Suddenly he felt the light touch of a fin. The little blue fish was back! “Rainbow Fish, please, don’t be angry. I just want one little scale.” The Rainbow Fish wavered. Only one very very small shimmery scale, he thought. Well maybe I wouldn’t miss just one. Carefully the Rainbow Fish pulled out the smallest scale and gave it to the little fish. “Thank you! Thank you very much!” The little blue fish bubbled playfully, as he tucked the shiny scale in among his blue ones. A rather peculiar feeling came over the Rainbow Fish. For a long time he watched the little blue fish swim back and forth with his new scale glittering in the water. The little blue fish whizzed through the ocean with his scale flashing, so it didn’t take long before the Rainbow Fish was surrounded by the other fish. Everyone wanted a glittering scale. The Rainbow Fish shared his scales left and right. And the more he gave away, the more delighted he became. When the water around him filled with glimmering scales, he at last felt at home among the other fish. Finally the Rainbow Fish had only one shining scale left. His most prized possessions had been given away, yet he was very happy. “Come on Rainbow Fish,” they called. “Come and play with us!” “Here I come,” said the Rainbow Fish and happy as a splash, he swam off to join his friends. 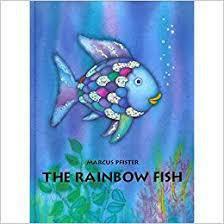 The Rainbow Fish by Marcus Pfister | Read Along The award-winning book about a beautiful fish who finds friendship and happiness when he learns to share is now available in a board book edition for the youngest child. Thank you for watching today's storytime with Ms. Becky! A lone polar bear decides that he can't stay in the arctic as the ice is melting around him and he is hungry. 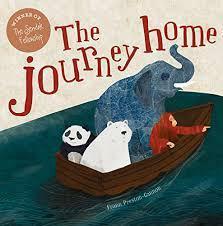 He builds a boat and sails across the oceans picking up other endangered creatures along his way; an orangutan who is surrounded by tree stumps; an elephant who is trying to out-run a poacher and a panda without a home. Finally, the boat full of creatures reaches an island that can only be described as paradise. A dodo greets them and explains that they can go home when more trees are planted, when the ice stops melting and when the poachers stop hunting for tusks. The hopeful animals huddle together watching the sun set over the ocean wondering what tomorrow will bring. Polar Bear Polar bears are only found in the Arctic. The most important habitats for polar bears are the edges of pack ice where currents and wind interact, forming a continually melting and refreezing matrix of ice patches and leads (open spaces in the ocean between sea ice). These are the areas of where polar bears can find the greatest number of seals. As the sea ice advances and retreats each season, individual polar bears may travel thousands of miles per year to find food. Polar bears are distributed throughout the Arctic region in 19 subpopulations, including Alaska, Canada, Russia, Greenland and Norway. Panda Giant pandas live in a few mountain ranges in central China, in the Sichuan, Shaanxi, and Gansu provinces. They once lived in lowland areas, but farming, forest clearing, and other development now restrict giant pandas to the mountains. Giant pandas live in mountainous forests that are rich in bamboo (the only food they eat). Torrential rains or dense mist throughout the year mean their home is often covered in heavy clouds. Orangutan Orangutans are only found on the islands of Sumatra and Borneo in Southeast Asia. Orangutans are arboreal creatures, which means they spend most of their lives slowly walking, swinging and climbing through dense rain forests. Orangutans are losing their homes as tropical rainforests are being cut down for wood to make paper and furniture and the land is cleared to grow palm oil. Elephant African elephants are found in both the deserts and rainforests of west and central Africa. The Asian elephant is found in India, Sri Lanka, China and much of Southeast Asia. Habitat loss is one of the key threats facing elephants. Elephants’ habitats are getting hotter and drier. Humans are taking over more and more elephant habitat. Poaching for ivory are additional threats that are placing the elephant’s future at risk. A nature poem for every day of the year. Selected by Fiona Waters. "In this funny and stylishly illustrated follow-up to Dave's Cave, two lovable cavemen endeavour to make their rocks the very best they can - inventing, in the process, something rather remarkable." My World: a Book of First Words. 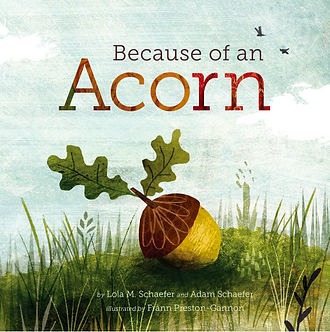 "This touch adds levity and playfulness to the picture book, which never develops into a story but provides readers with ample visual interest with pictures tied to an array of vocabulary... What a wonderful world of words and pictures"
Because of an acorn, a tree grows, a bird nests, a seed becomes a flower. Enchanting die-cuts illustrate the vital connections between the layers of an ecosystem in this magical book. 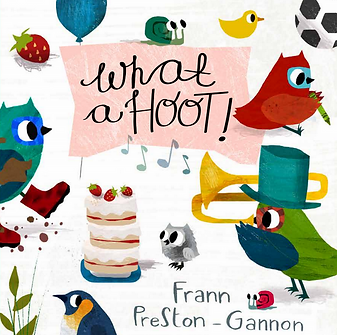 'This is a beautiful book that celebrates things close to my heart – children’s imaginations, the power of books, and the natural joy of animals. First counting board book featuring animals under the sea. The Dinosaurs are back and this time they are at the beach! Join them as they get up to mischief in the sand. Everyone knows that once a lemur takes a fancy to you there is not much that can be done about it. 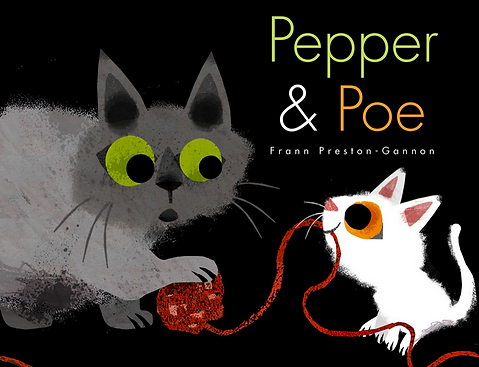 A deliciously entertaining story about friendship and loyalty and why they matter. Once a lemur likes you there is nothing you can do to shake it off! A young boy, befriended by a lemur, tries to shake it off by travelling across the sea, up in the sky, through the desert and more. But the lemur – and its friends are never far away! And that turns out to be just as well when the boy tries to make his way home! 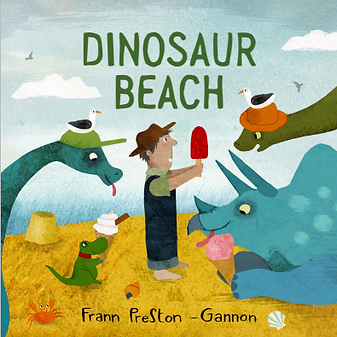 "Frann Preston Gannon's gentle storytelling style, interesting plots and fantastic artwork set this book a cut above the usual dino-based fare. 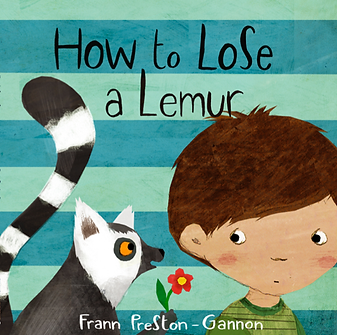 It's very easy to see why Frann won a Sendak Fellowship and got to study with the great Maurice Sendak himself." The Junior Magazine prize for best newcomer & best picture book. 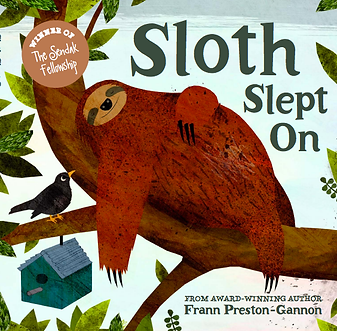 A thought-provoking story with a powerful message about conservation from an award-winning, rising illustrator and literary star.